However. If you’re in Grahamstown, you have ONE chance to catch Crazy – next Wednesday, 29th April, at 8:30pm. Tickets are incredibly limited, so book now via uglibob(at)gmail(dot)com. Powerful, passionate and desperate – Crazy In Love has created a significant impression on the fringe festival circuit where it won the Best International Production at 2014 Amsterdam Fringe Festival and a Standard Bank Ovation Award at 2013 National Arts Festival Fringe. It was also the top selling show on debut at 2013 National Arts Festival Fringe and at the inaugural Cape Town Fringe Festival 2014, and was a box office success at Witness Hilton Arts Festival in 2013. Most recently, this momentum has turned into more mainstream exposure with a critically and commercially successful season at the famous Market Theatre in Johannesburg. 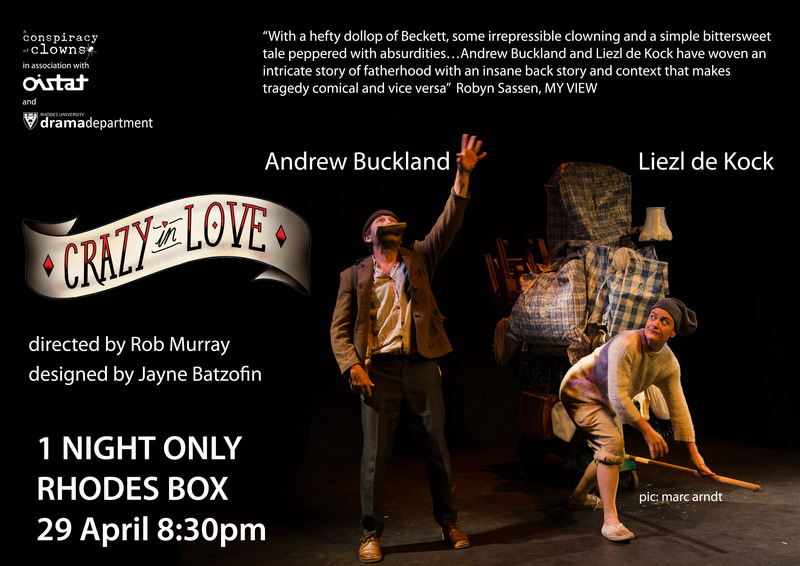 This entry was posted on Thursday, April 23rd, 2015 at 2:37 pm	and tagged with A Conspiracy of Clowns, Andrew Buckland, clowns, Crazy in Love, Jayne Batzofin, Liezl de Kock, Rob Murray, theatre and posted in Crazy in Love, Industry News, Shows. You can follow any responses to this entry through the RSS 2.0 feed.